I picked this book up as part of Penguin’s half price sale last December. To be honest, I knew very little about it other than what I’d learnt from watching the teenage film Easy A, that an adulterous woman living in a Puritan community is forced to wear a large, scarlet letter ‘A’ on her clothes so that everyone can identify her as a sinner. I was intrigued by the story and how this woman would deal with her situation and whether or not the townspeople would forgive her, so I decided to give it a go. The book begins with an introduction entitled ‘The Custom-House’. I struggled with it a little to be honest, I found the writing style quite dense and I hadn’t quite worked out what its relevance was to the story of the scarlet letter. It feels like a tableau of its own and I felt it to be superfluous as it was only towards the end of the introduction that I actually started to get into the book. This is when the narrator comes across a manuscript written 100 years before by a customs officer about a woman called Hester Prynne and a scarlet piece of fabric in the shape of a capital letter A. Although I wasn’t particularly enamoured with the introduction, it does serve a purpose, showing just how far removed the narrator is from Hester’s tale, and by implication, how far again the reader is removed as Hester was alive in the seventeenth century and her story is not her own but filtered through two different male writers. I definitely enjoyed the second half of this novel more than the first. I think it doesn’t help that the story begins with Hester emerging from the prison and being vilified by the townspeople. I think I would have liked a little more preamble about Hester’s life before her ‘sin’. I wanted to know her motives, and her attraction to the man who fathered her child, Pearl, but it does give the reader a sense of how much Hester is defined by her ignominy and the scarlet letter as she is afforded no history prior to this. There were some interesting scenes in the book, it’s split into chapters that describe different scenes and I did enjoy the structure of the book – I think probably because they were manageable chunks as Hawthorne’s writing style can be a bit heavy at times and I found I couldn’t read it for long periods of time. There are a couple of things that I won’t say as I don’t want to give away the story (even if it was written in 1850!) but I did enjoy the brooding presence of Roger Chillingworth and his machinations, and the scene where Pearl’s father becomes giddy after planning to run away with Hester and finds himself wandering through the town with thoughts of mischief, as if some tap has been turned on and he has been hiding all of his malicious thoughts away. 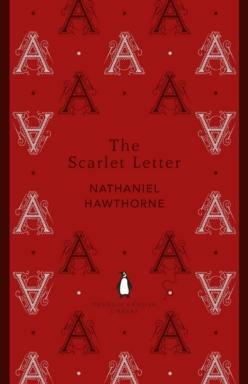 I did get a little tired of the imagery and symbolism in The Scarlet Letter – Hawthorne is constantly going on about how the scarlet letter burns into Hester’s bosom, and how Pearl is the physical embodiment of the letter – the sin brought to life in a wild and disobedient child. There were moments when the writing was passionate though it can be over-descriptive at times. Despite this I enjoyed The Scarlet Letter for its story and the character and resove of Hester Prynne.